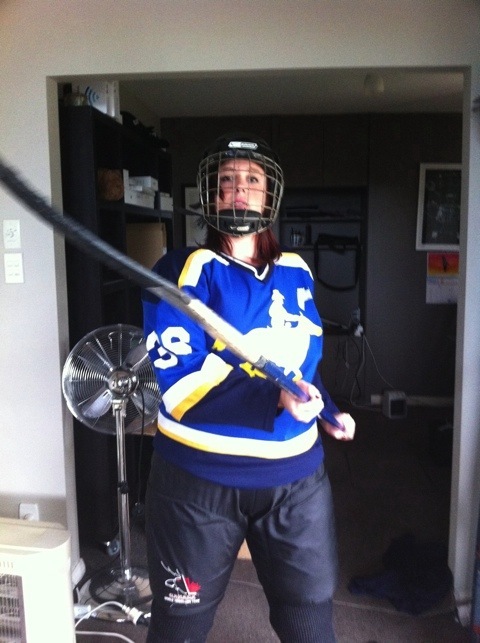 Finally, it’s that time of the year again…hockey season. I’m really looking forward to playing again. Last year I played two seasons back to back with the women’s league then the B Grade non-contact. It was great for my skills to play for a year non-stop, but hard on my body. I’m hoping that the six-month break will have rested my poor old frame long enough to see the season out. Non-contact hockey is not at all dangerous so I have no worries about injury, but hockey in general is a very physical sport – you use a lot of muscles racing up and down the ice chasing after that puck! I’ve been trying to prepare myself with running and gym classes, but there really is no form of exercise that matches the demands of hockey. This year we have a new team member, my daughter Megan. She’s been skating a few months now, and is already at least as good a skater as I am. And hockey is a great way to improve your skating skills – you go hard-out and you soon forget that you’re skating as you become immersed in the action. If you fall over, it (mostly) doesn’t hurt with all the padding you wear.